In the 1950’s, Jews were immigrating into Israel from the surrounding Arab countries, bringing with them a whole new gallery of flavors to the local cuisine. One dish especially became so common, that one can’t imagine Shabat dinner without it. And that’s Hrayme. Hrayme is a common Lybian-Tunisian casserole, made of sea fish, cooked in thick spicy sauce based on oil, filfil-chuma (a mix of minced garlic and dried hot peppers) and tomato paste. The versions for this dish are endless. Some use fresh chillies and tomatoes. Some add more vegetables, like bell peppers and even, god forbid, carrots. But no one, at least no one I know, has replaced the fish with cauliflower. So behold, here is the best vegan Hrayme you have tried by now. The cauliflower here is so tasty because it goes through a three-level treatment, supposed to give it its wealth of flavors and textures. Together with wakame seaweed to five it the sea flavor we want to have, and coated in a nice batter based on chickpea flower to both give it the protein dose and to absorb all of the goodness of the sauce while it cooks. Beware – like many Lybian-Tunisian foods, this one is hot and fatty. And yet, an unresistable delight. So let’s start with stage 1: Preparing the cauliflower. 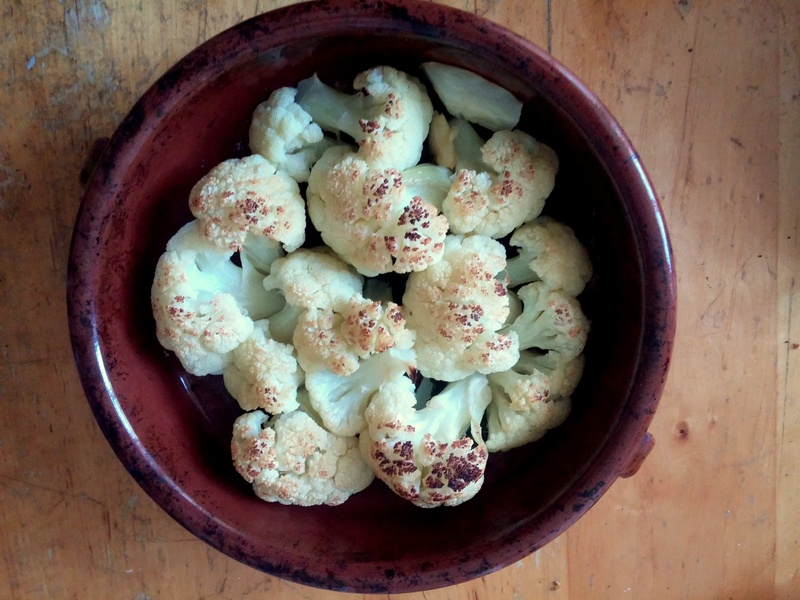 You will need 1 medium cauliflower, cut to medium-small florets. Take a heavy clay oven plate, sprinkle some pieces of wakame (around a handful) and place the florets on top. Throw in between two broken cloves of garlic. Spread with around 1/5 cup of olive oil and season with salt to taste. 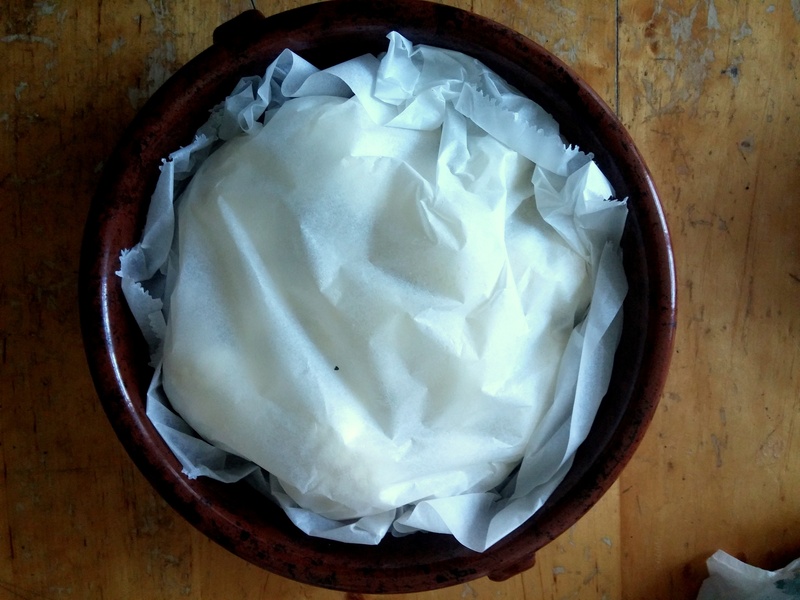 Cover well with baking paper, wrapped from the inner part of the clay plate. Send into the oven. 20 minutes, maximum heat (250 C). When it’s ready the florets will be soft and still chunky, and golden at the top. Uncover and let to cool next to a window. While the cauliflower cools, boil some vegetable oil in a small pot for deep frying. Make a batter from 1 handful of wakame seaweed, ground to powder; 4 spoons fine chickpea flour (gram flour); 1 handful chopped coriander; 1/2 tsp baking powder; salt; dried garlic; 3/4 cup water. Stir well and let the batter stand for 10 minutes, the seaweed will absorb some water. 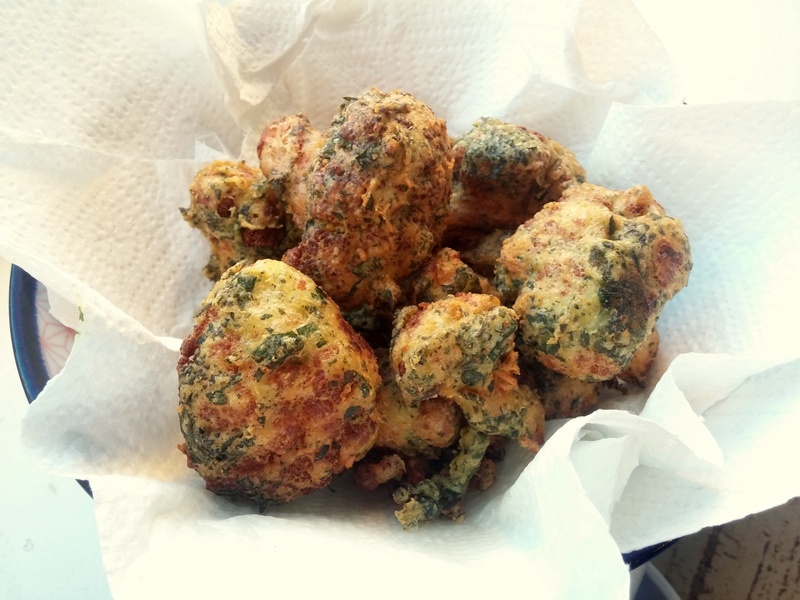 Coat the cauliflower florets in the batter and deep fry until solid. Remove and leave on some kitchen paper to absorb the extra oil. And try not to munch on too many, since they are super tasty as it is. In a shallow, heavy pot place 1/3 cup olive oil, 10 minced garlic cloves, 1 spoon dried chillies or 3-4 hot green chillies, cut to thin slices (and if you want, cumin goes here as well), and place on a low flame for around 10-15 minutes, until small bubbles are created next to the garlic and the smell of the kitchen changes from deep-fry to garlic fume. Don’t let the garlic get golden, when it is transparent, it’s ready. Then you add 4-5 medium tomatoes, diced. season generously with salt, increase to high flame and cover. After 10 minutes, you’ll have sauce. 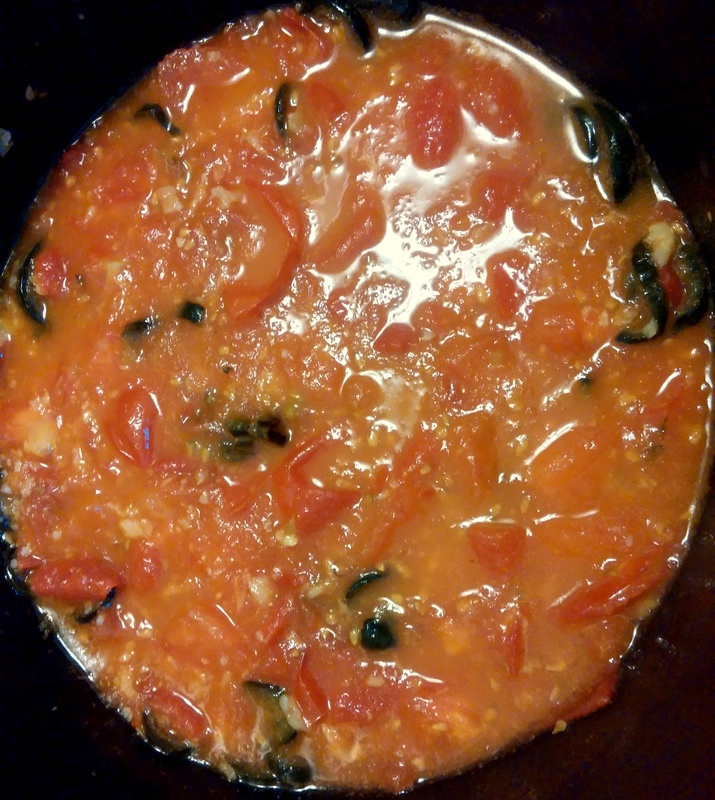 Squash the tomatoes with a wooden spoon while mixing, and heat for another 3-4 minutes while it;s uncovered to thicken. Take off the flame, arrange the fried florets upon the sauce, push them gently down. Ideally, they will be half-in, half-out. Cover, place on a medium flame for another 3-4 minutes, the florets will drink the sauce. Serve with thick slices of comforting bread, from the kind that will drink the sauce if you dip it in it. Liked the idea of vegan fish? You’d might also like vegan fish and chips. Want more North African food? Try Vegan Shakshuka. 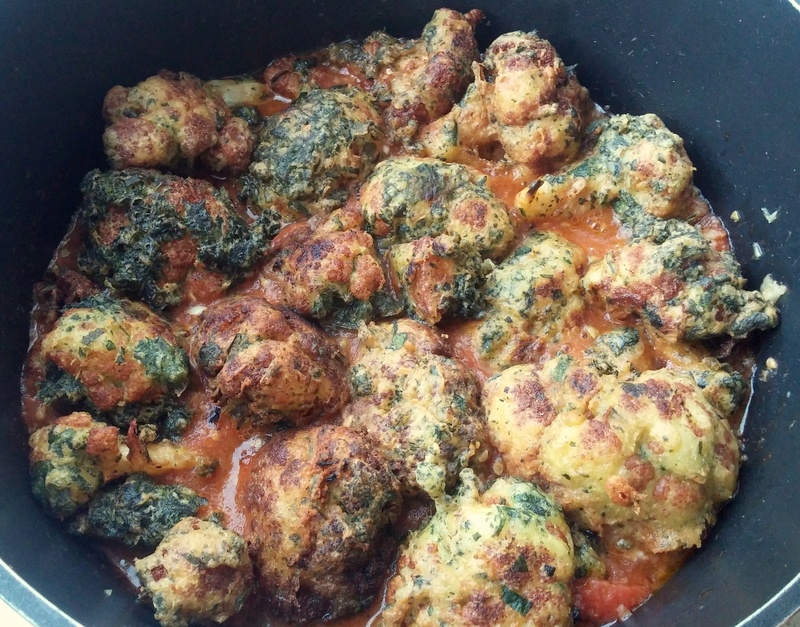 And for another cool idea for your cauliflowers, try cauliflower burgers. Posted in Main Courses, SubstitutesTagged African Food, Cauliflower, Garlic, Spicy Food, Tomatoes, Vegan Cooking, Vegan Fish, דג טבעוני, חריימה טבעוני, טונה טבעוניתBookmark the permalink.